LetsTransport.in, a marketplace that connects users with last-mile logistics service providers for intra-city deliveries, has raised $1.3 million in a funding round led by Japanese venture capital firm Rebright Partners. Serial entrepreneurs Ankush Nijhawan, Gaurav Bhatnagar and Manish Dhingra also put money in this round, Diptab Ventures Pvt Ltd, the company behind LetsTransport, said in a press statement. "We wanted to be confident of our model; hence we had not raised funds externally initially. Now that both our clients and drivers have confidence in us, we believe the time is opportune and we are ready to scale-up. With Rebright Partners coming on board, we believe that they will guide us in building a great organisation and time-sustained symbiotic relationship with our clients. " said Sudarshan Ravi, co-founder of LetsTransport. LetsTransport was founded early this year by Ravi along with Pushkar Singh and Ankit Parasher, all IIT Kharagpur graduates. The startup serves clients in food, retail and distribution sectors. In June this year, LetsTransport had acquired Shifter, a similar venture which connects mini-truck owners, for an undisclosed amount. Takeshi Ebihara, founder and general partner at Rebright Partners, said: "We have explored similar markets in Southeast Asia and we see immense potential in the on-demand logistics market in India. The team has brilliant operational insights developed from grass-root level knowledge, which has enabled them to conceptualise a relevant global product having the ability to disrupt the logistics space." Tokyo-and Singapore-based venture capital firm Rebright Partners focuses on seed to early stage investing. The company had roped in Brij Bhasin from startup accelerator GSF to lead its activities when it ventured into the Indian market earlier this year. According to Bhasin, Redbright typically invests between $100,000 and $1 million in startups. It has already put money in Bangalore-based Tookitaki Holding Pte Ltd, the company behind data intelligence startup Tookitaki, and Delhi-based ADA News in Shorts Pvt Ltd, owner of News in Shorts (now rebranded to inshorts). A bunch of tech startups have joined the business of connecting logistics services providers with customers for intra-city transport over the recent past. These ventures are asset light and do not own the vehicles themselves and comes across as a booking platform similar to taxi hailing apps Ola and Uber. Indeed several have also raised angel or VC funding. Pickingo, a B2B on-demand hyperlocal logistics start-up, said on Tuesday it has raised $1.3 million from Rehan Yar Khan of Orios Venture Partners along with Zishaan Hayath. There were two investments in this space last month. While on-demand booking platform for mini-trucks Moovo.in raised an undisclosed amount in seed funding from cricketer Yuvraj Singh's venture investment fund YouWeCan and others, Bangalore-based theKarrier raised Rs 1.5 crore ($240,000) in a seed round of funding led by Sol Primero. 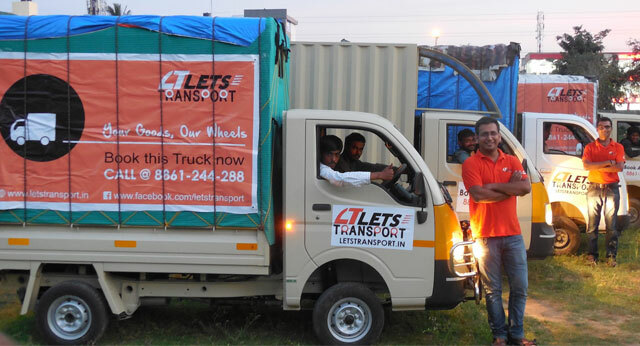 In April, Mumbai-based Resfeber Labs Pvt Ltd, which runs online logistics marketplace The Porter to book mini-trucks and tempos for intra-city pick-up and deliveries, raised Rs 3 crore (just under $500,000) from Kae Capital. It is now raising a larger Series A funding round. Last November, Blowhorn raised an undisclosed amount in seed funding from impact investor Unitus Seed Fund, with participation from Tim Draper, founder and managing partner of Draper Associates. Full service logistics providers are also attracting money. Private equity firm Warburg Pincus committed to invest over Rs 850 crore ($133 million) in Delhi-based e-commerce focused logistics solutions provider Ecom Express Pvt Ltd. This is the biggest ever PE funding in rupee terms in India in the logistics sector and the second largest in dollar terms. In 2011, a fund under Franklin Park Management bought Bangalore based Vikram Logistic and Maritime Services Pvt Ltd for $152.57 million, according to VCCEdge, the data research platform of VCCircle. According to market research firm Research and Markets, the Indian logistics industry is expected to grow at a compounded annual growth rate of 12-17 per cent by 2020, driven by the growth in the manufacturing, retail, FMCG and e-commerce sectors. LetsTransport.in Rebright Partners Pte Ltd.